There is, perhaps, no better time than fall in the Ozarks to pack up your car or camper and head toward undiscovered adventures in the great outdoors. 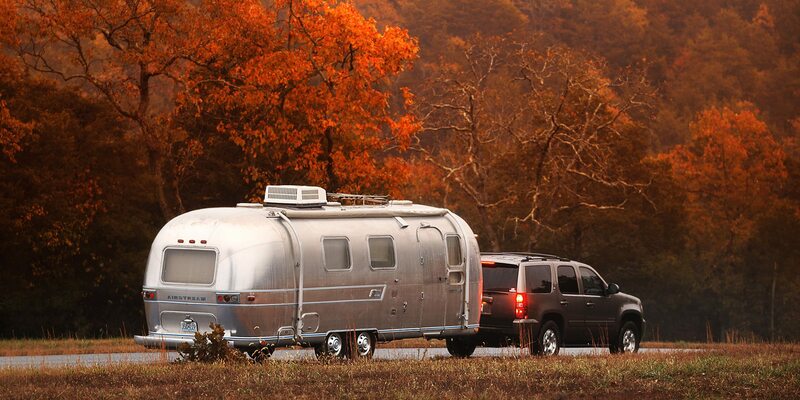 Crisp air, rustling leaves and chirping birds greet you as you pull up to your campsite and set up your temporary home. As dusk turns to darkness, the day’s heat breaks, replaced by a cool night breeze. Crackling fires pop up around you as the stars above begin to twinkle, and the chorus of crickets grows louder. When you turn in for the night—relaxed and without a single unanswered notification on your phone—the constant melody lulls you to sleep. This is what you came for, and we can help you get there. 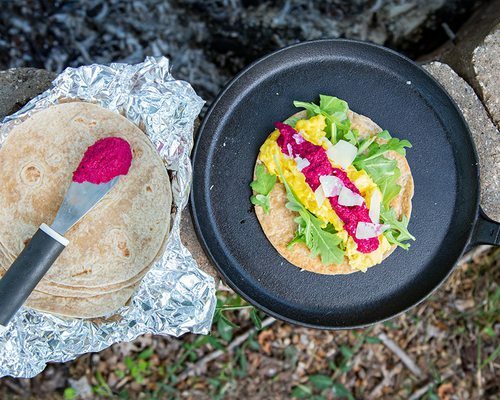 Whether you’re a nature novice, experienced explorer or cabin camper, this guide shares the very best of Ozarks camping, including where to go, what to eat and how to make the most of your night under the stars. 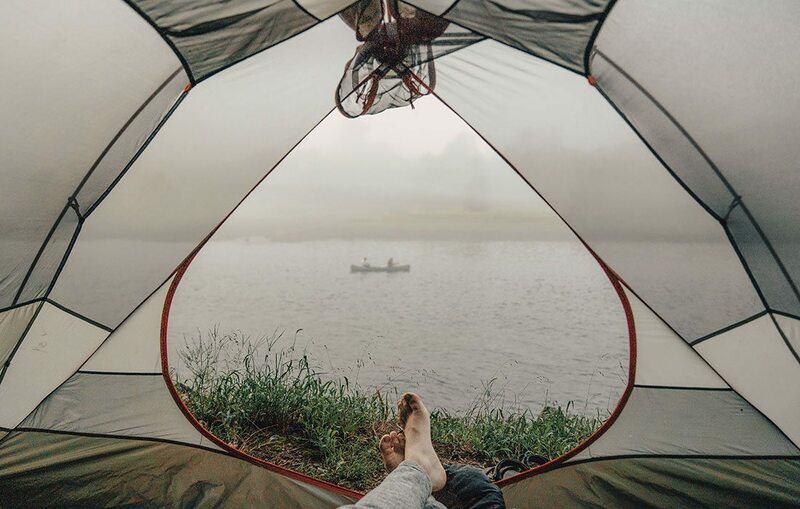 Photo by Jeff RoseReserve a campsite at Bull Shoals–White River State Park that is right along the river so you can watch boats cruise by each morning. Wake up by the water—and then keep playing in it! Distance from Springfield: 2 hours, 15 minutes | Camping Level: Civilized | Cost: $13–34 | Sleep Here: Hammock-friendly site 106 (tent-only) is slightly secluded. | Upgrade Your Stay: Book one of the park’s three Rent-an-RVs or reserve a room at Gaston’s White River Resort. Our region’s lakes are some of the best natural gems around. Combine lake life with a camping trip and you’ve got a perfect pair. There are many places to achieve this level of outdoor perfection, but Bull Shoals–White River State Park in Bull Shoals, Arkansas, tops our list. It has plenty of amenities and a bounty of activities and is quite beautiful. Construction is nearly complete on the renovation and expansion of the park’s campground, which will soon have 112 sites. We recommend making reservations due to the White River’s national acclaim as a top trout-fishing destination. Many campsites sit right along the river, and if you’re lucky enough to book one, you can watch boats zip past as the morning fog breaks. That is, if you’re not joining in on the fishing fun. 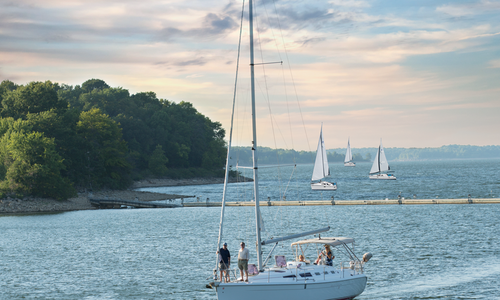 Stock up on bait at the park’s marina, which also has boat rentals, before hitting the water. Those less inclined to reeling in a catch can float the river in a kayak or canoe, also available for rent at the marina, or reserve a seat on a park interpreter–led river or lake cruise. The minimally developed shorelines on Bull Shoals Lake afford breathtaking landscapes and habitats for many animals, including approximately 100 bald eagles each winter. You might be able to spot America’s bird on a cruise or at the overlook on the 1.75-mile Big Bluff Trail. Take a dip in the lake at nearby Brown’s Beach or Lakeview Public Use Area, where there is a daily use fee. In the park, hike or mountain bike and don’t forget to stop at the James A. Gaston Visitor Center for a view of the Bull Shoals Dam, which was the fifth largest dam in the world when it was completed in 1951. The park also hosts a handful of annual events. Each January, there’s Eagle Awareness Weekend, during which you can learn more about and observe these birds of prey up close. Trout Days, held in June, combines camaraderie and competition for a fun-filled weekend. And women can connect with nature and build their outdoor skills at the Women’s Outdoor Weekend every October. Once you've picked your camping destination it's time to plan out the details. Use each of the stories below to prep yourself for a great trip. Photo by Jeff RoseEcho Bluff and Sinking Creek are two must-sees at Echo Bluff State Park. While away the days among wild horses and historic sites. Distance from Springfield: About 2 hours, 30 minutes | Camping Level: Civilized | Cost: $12–35 | Sleep Here: Site 19 faces the woods in an otherwise open campground. | Upgrade Your Stay: Stay at the Betty Lea Lodge or one of the park’s 13 cabins and duplexes, also available to rent. The widely known secret about Eminence’s Echo Bluff State Park is out: This park is awesome. So awesome, in fact, that it has been tough to reserve a campsite since Echo Bluff opened in July 2016. The former youth summer camp now boasts 72 basic and premium sites at Timbuktu Campground, a lodge, cabins, duplexes and several activities. 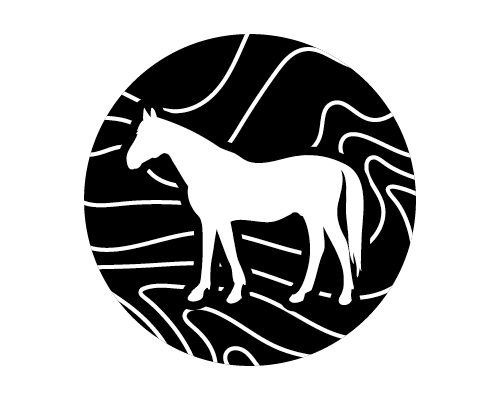 Southeast Missouri has long been home to wild horses, which are typically hard to find. But at Echo Bluff State Park, spotting these creatures is easy as they frequent the campground regularly. Be sure to visit Sinking Creek, which winds throughout the park. The water is perfect for families with young children, and you can marvel at the park’s namesake, Echo Bluff. More adventurous types can head to the Current River for a day of floating fun. 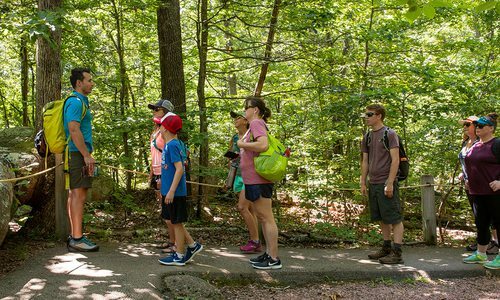 Travel back in time on a 90-minute, lantern-lit tour of nearby Round Spring Cave (closed Labor Day through Memorial Day) or to the former corporate retreat of the Alton Box Board Co., built in the ’30s and ’40s, at Current River State Park. Both attractions are a quick drive away on state highway 19. Spend your evenings at Echo Bluff’s Betty Lea Lodge, where you can play board games, enjoy a view of the bluff from the patio’s rocking chairs or cozy up by one of the fire pits. Photo courtesy ShutterstockDon't forget to pack a swimsuit and water shoes so you can enjoy the water and falls in Haw Creek. 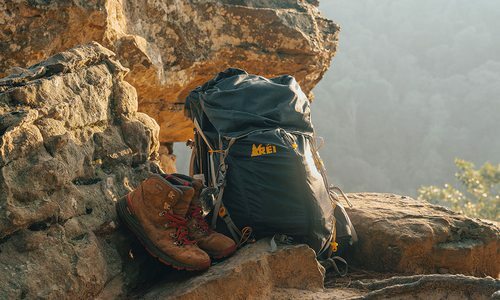 Get a backcountry experience without the hassle of backpacking. Distance from Springfield: 2 hours, 45 minutes | Camping Level: Very primitive | Cost: $4 | Sleep Here: Site 7 is within earshot of the falls. True solitude is hard to find these days, but not at Haw Creek Falls Recreation Area, where the closest cell reception and internet access is miles away. This serene Arkansas retreat is tucked deep in the Ozark–St. Francis National Forests, about halfway between Hagarville and Sand Gap. Consider this campground, managed by the U.S. Forest Service and closed from late December to late March and during high water, a training ground for your first backpacking trip. Aside from trash cans, vault toilets and nine basic campsites, you’re on your own. That means doing your research beforehand and bringing enough food and water for your stay. Don’t forget your swimsuit and water shoes so you can lounge around in Haw Creek and enjoy the falls. Find more waterfalls by taking the Pack Rat Falls Trail that begins behind site 6 or the Pam’s Grotto Waterfall Trail, across Highway 123. 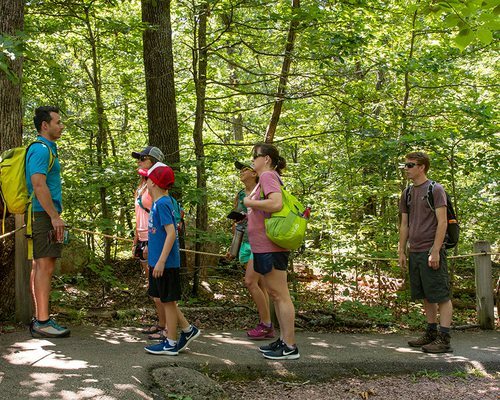 Hop on the Ozark Highlands Trail, spanning more than 197 miles and growing, at the campground or as you head north on Highway 123 just before you reach Sugar Creek. About half an hour away, rock formations, bluffs and another waterfall await at Pedestal Rock Scenic Area. 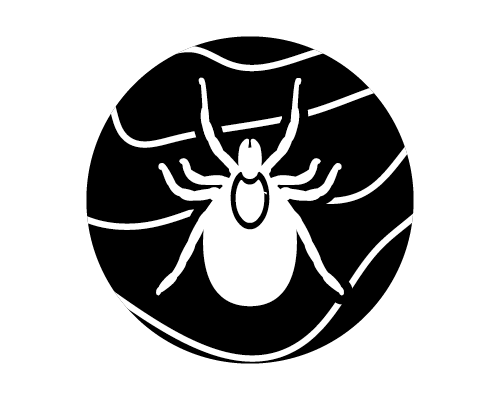 Ticks are everywhere in the Ozarks, especially in the summer. Avoid these pesky parasites with tips from the Missouri Department of Conservation’s Robbie Doerhoff. 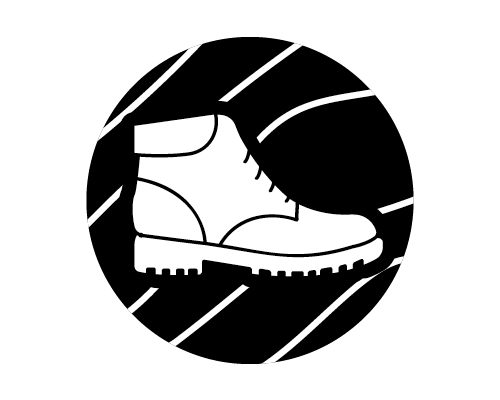 Wear light-colored long pants, long sleeves and permethrin-treated socks. Plus, use bug spray with 20–50 percent DEET. At the end of your adventure, don’t forget to do a tick check! Pay special attention to areas around waistbands or other tight clothing. Remove any ticks you find with your fingers or a pair of tweezers, pulling the bugs straight up from your skin. Ticks can spread disease, so save any that bite you for a month. If you start feeling ill, visit your doctor and present the possible culprit for testing. Head east for a centrally located adventurer’s playground. Distance from Springfield: 3 hours, 45 minutes | Camping Level: Very civilized | Cost: $12–23 | Sleep Here: Site 19 has electricity and a paved pad and is close to all the action. | Upgrade Your Stay: The picturesque Old Orchard Inn in Farmington has four cozy rooms. Rarely can you find a place in the great outdoors that makes beginners and more ambitious explorers feel equally at home. Hawn State Park in Ste. Genevieve achieves this feat and, put simply, is camping at its finest. The 51-site campground is family-friendly and wonderfully versatile, including electric, basic and walk-in spots; a playground; a frost-free water spigot for winter excursions; and an unparalleled bathhouse with large bathrooms, unisex shower stalls and a coin-operated laundry facility. Shortleaf pine trees and hardwoods such as white oak and red maple tower overhead, as they do throughout the park, and tent campers enjoy soft ground here. 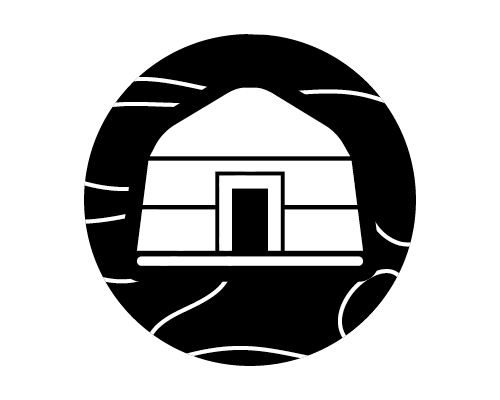 The sites are mostly exposed, but that makes it all the easier to strike up a conversation with your neighbors. The park’s five backpack camps provide an added challenge for those who seek it. Once you’ve settled in, there’s plenty to see and do. Take the short, paved Overlook Trail to get a bird’s-eye view of rolling hills and the Pickle Creek valley. Speaking of Pickle Creek, getting up close and personal with this pristine water is a must. (You can see it from select campsites.) Eat lunch at the picnic tables near the Pickle Creek Trailhead before hitting the 1.4-mile round-trip rugged trail or enjoy your meal creek-side. The park’s other trails are also worth exploring as long as you are comfortable with moderate to rugged hiking. If you need a break from nature, visit one of the many wineries in the area or head to nearby Farmington for a meal at 12 West Bar & Grill. Within an hour’s drive, you’ll also find three other state parks worth visiting for a quick day trip on your way home. Climb on gigantic boulders at Elephant Rocks, swim at Johnson’s Shut-Ins or visit Missouri’s highest point at Taum Sauk Mountain State Park. Photo by Jeff RoseCove Lake Recreation Area, north of Mount Magazine State Park, offers camping, boating, swimming and more. 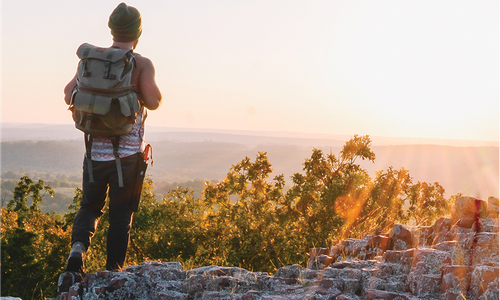 Hike to the highest point in Arkansas and revel in breathtaking vistas. Distance from Springfield: About 4 hours | Camping Level: Civilized | Cost: $28–34 | Sleep Here: Sites 15, 17 and 18 offer the most privacy. | Upgrade Your Stay: The park’s lodge or one of 13 cabins have views of the Petit Jean Valley. Compared to the rest of the park, Mount Magazine’s Cameron Bluff Campground is nothing special. 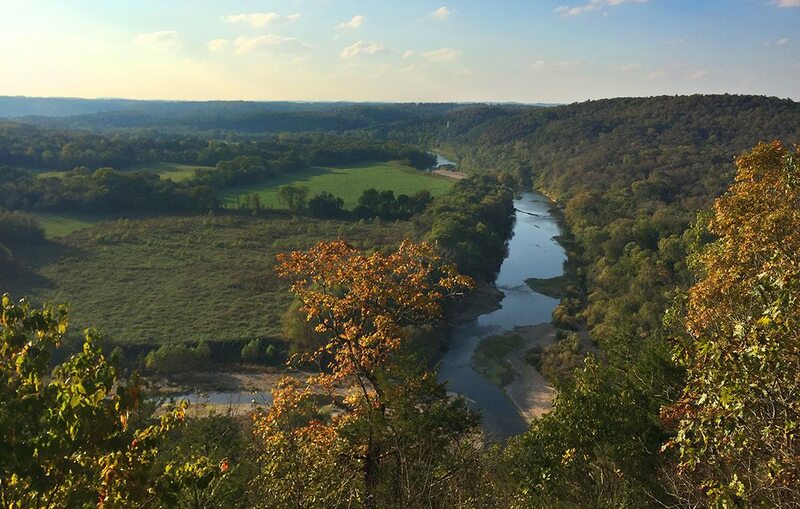 Don’t misunderstand us: A trip to this park—about 20 miles south of Paris, Arkansas, and packed with activities and unbeatable views that stretch for dozens of miles on a clear day—is well worth it. With three access points, hiking the quick and easy (albeit rather uninteresting) Signal Hill Trail to the state’s high point is practically required. The other must? Taking in the Petit Jean Valley and Blue Mountain Lake from The Lodge at Mount Magazine. Experienced hikers will appreciate Bear Hollow Trail, a 5.6-mile round-trip path with several noteworthy sights. Visitors can also rock climb (bring your gear! ), watch hang gliders and see the sunset on the Cameron Bluff Overlook Drive. Enjoy the undisturbed shoreline at nearby Cove Lake Recreation Area and dine at The Lodge’s Skycrest Restaurant one evening. Expect to see several deer and, if you’re lucky, a black bear. The shady campsites—all 18 of which are equipped with water, electric and sewer hook-ups—offer moderate privacy and excellent hammock spots. However, we recommend bringing an RV or air mattress, as the sites are very rocky. Download these apps to plan and enjoy your next camping trip. 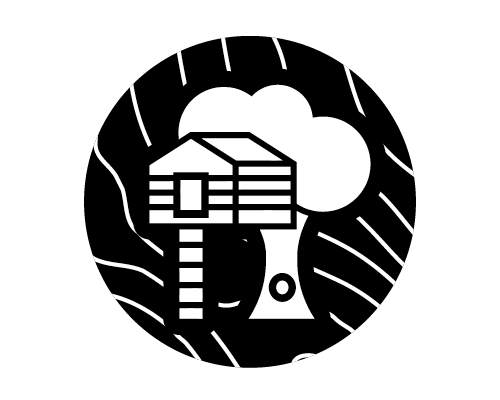 With more than 50,000 trails around the globe and a robust search tool, AllTrails makes planning your next walk in the woods easy. Each trail includes a map, directions and reviews and photos from other users. Save your favorites and, using the record function, track your progress in real-time. Access more sophisticated and downloadable maps, stay safe on the trail with the Lifeline feature and more by upgrading to a pro account, $2.50 per month or a one-time fee of $99.99. 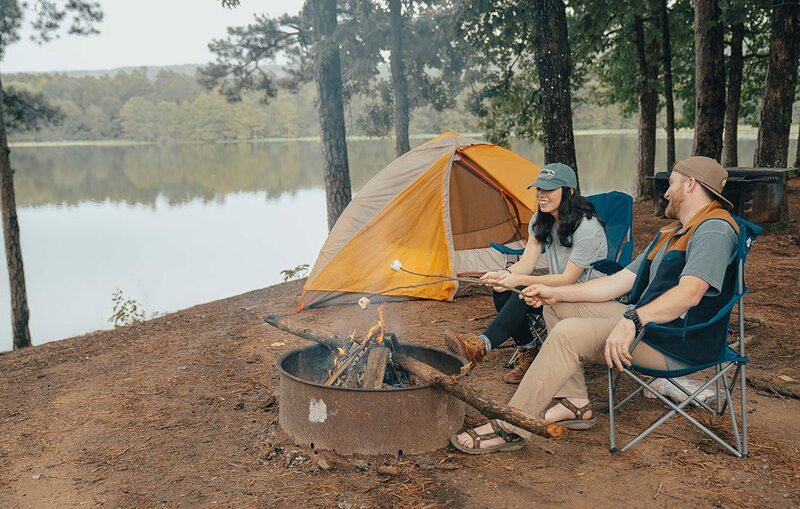 You can search campgrounds using the Coleman – Get Outdoors app, but where this app shines brightest is in its resources. Peruse activities and games for your kiddos, find easy-to-replicate recipes and learn from how-to articles and videos. It’s a must-have app for outdoorsy families. 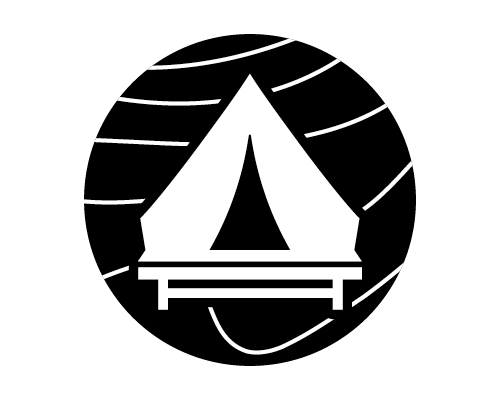 Reserve America’s official app, RA Camping allows you to search for and reserve a campsite all within the app. 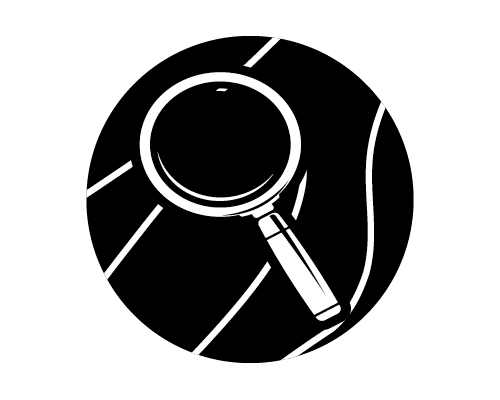 Filter your search based on site type, availability, amenities and more. Listings include public and private campgrounds in all 50 states. Ever find yourself wishing you had done research ahead of time to find the best local restaurants or places to take your kids? Stop right now and download Roadtrippers. This app searches for places to stay and things to do between your starting point and destination. Plus, you can save and share your itineraries with other people. Roadtrippers Plus, $29.99 per year, offers live traffic conditions, offline maps, expanded trip options and more. When it comes to camping with an RV or trailer, not all campgrounds are created equally. The RV Parks & Campgrounds app is a searchable database of RV-friendly places to stay, stops and gas stations in the United States, Canada and Mexico. Turn your phone into the ultimate astronomy guide with the help of this app and your phone’s camera. Spot constellations, learn about celestial events and more. In-app purchases are required to access some features, and an ad-free iOS version is available for $2.99. Photo courtesy ShutterstockSpot one of the more than 100 free-roaming bison within Prairie State Park. Sleep where the bison roam and venture into Missouri’s largest tallgrass prairie. Distance from Springfield: 1 hour, 45 minutes | Camping Level: Primitive | Cost: $12–13 | Sleep Here: Site 1 has space for a group or a roomy stay. | Upgrade Your Stay: Himmel House Bed & Breakfast in Pittsburg, Kansas, is an easy half-hour drive away. 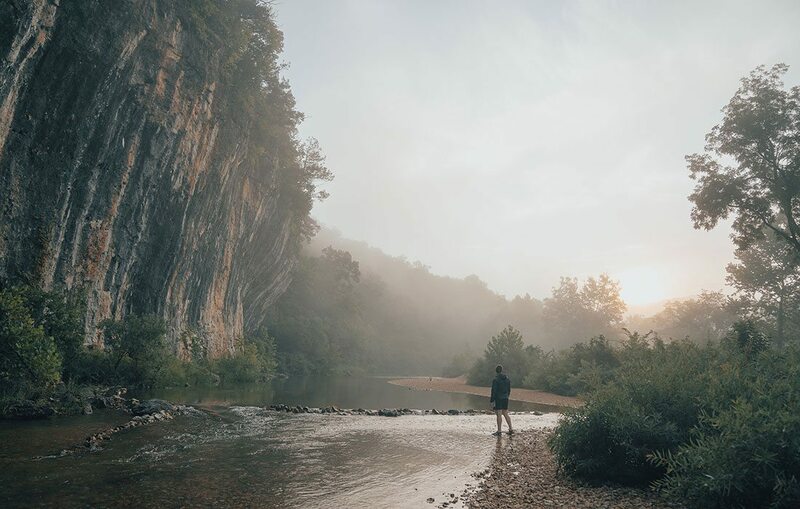 If you’re a regular Ozarks explorer, you’re used to the rocky trails, dense woods and frequent creek crossings that come with our region’s karst topography. Prairie State Park, just east of the Kansas border in Mindenmines, is a lovely departure from this norm. As the name implies, this is prairie land. Fields of wildflowers and billowing grasses abound in the nearly 4,000-acre park. 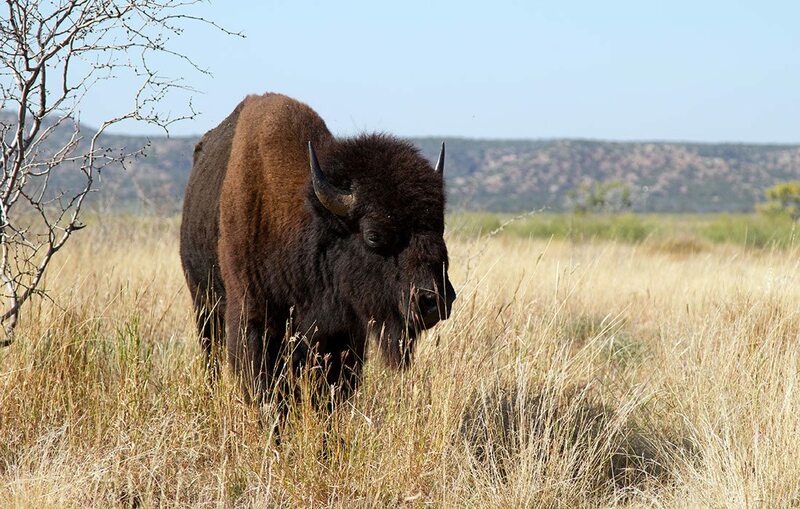 And that’s not all—Prairie State Park is home to about 100 free-roaming bison and more than 150 bird species, among other animals. Spot the bison herd on a guided hike, held the first Saturday of each month, or stop by the park office to find its whereabouts that day. At the office, you can also find bird and wildflower checklists; use them as you explore one or more of the park’s six trails, which are all less than 5 miles and rated easy. For even more birding, head to nearby Shawnee Trail Conservation Area. You can also hunt, fish and trap on this land, managed by the Missouri Department of Conservation. Be sure to check season dates and regulations at mdc.mo.gov. Camping at Prairie State Park is on a first-come, first-served basis. The campground, unlike the rest of the park, is in a small thicket outside of the fence line, meaning no bison will stampede through your camp. There are four drive-in sites and one backpacking site on the Coyote Trail. Sites 2 and 4 even comply with ADA access guidelines and can fit smaller campers, but, beware, there are no hookups. A clean single-stall vault toilet, water spigot, dumpster and large picnic area are all short walks from the campground. At night, you’ll likely hear owls hooting, coyotes howling and a distant train horn. Best of all, the park’s relatively low traffic might just mean you have the place all to yourself. 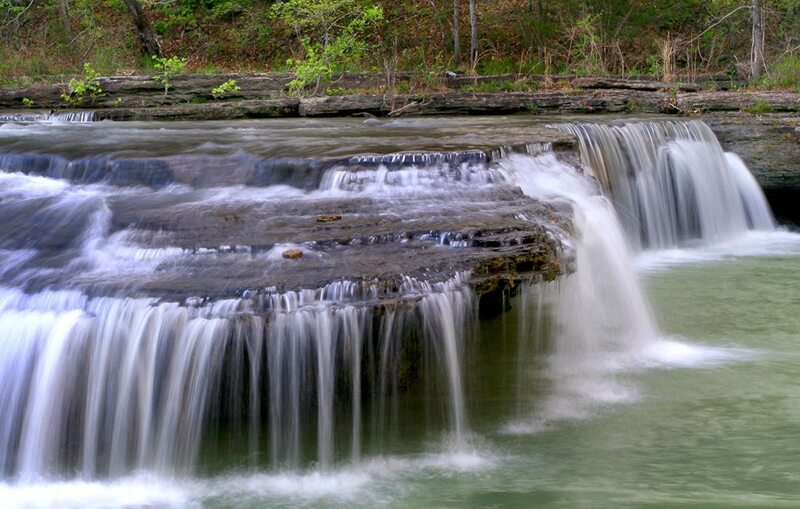 Rest your head near awe-inspiring bluffs and the gorgeous Buffalo National River. Distance from Springfield: About 2 hours | Camping Level: Civilized | Cost: $16 | Sleep Here: Sites 12 and 13 are pull-thru sites. | Upgrade Your Stay: Cozy into one of 10 cabins at Buffalo Camping and Canoeing at The Gilbert General Store just 15 minutes away. If you haven’t experienced the splendor of the Buffalo National River, it’s high time. This natural playground is practically in 417-land’s backyard and is replete with crystal clear water ideal for floating, hiking trails, plus incredible views of bluffs and the stars above. Take it all in at Tyler Bend Campground in the river’s middle district south of St. Joe, Arkansas. Easily accessible, this is a great spot for casual car or RV camping. 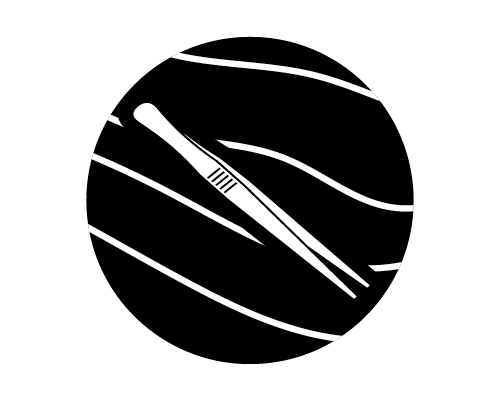 There are 28 regular, 10 walk-in and five group sites, which are the only spots you can reserve. You won’t find hookups here, but restrooms with showers, water spigots and a dump station make for a pleasant stay. (During winter, only primitive camping is available and fees aren’t collected.) 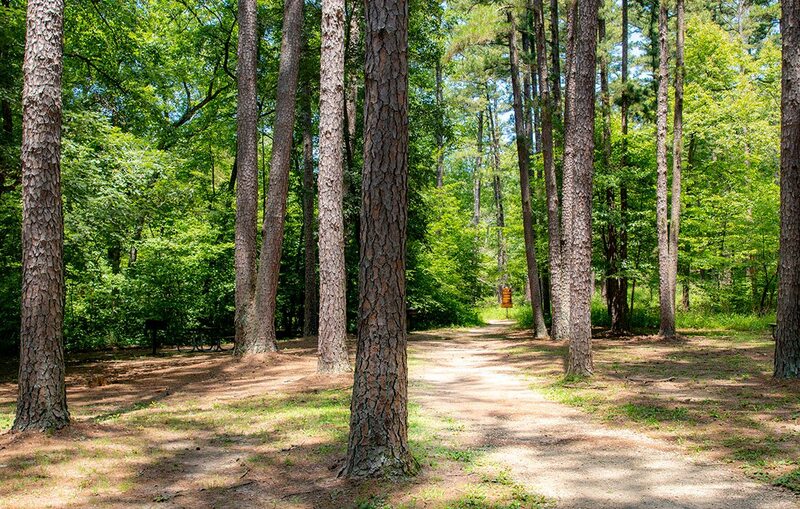 From the campground, walk to the river or head down one of the easy-to-moderately–rated Tyler Bend Campground Trails. Be sure to watch the sunset from the Riverview Trail’s overlook deck. On your way home, eat breakfast at Ferguson’s Country Store and Restaurant near St. Joe. It’s kitschy in all the right ways. For many 417-landers, trailers, pop-up campers and RVs provide access to the outdoors without the hassle and pains of tent camping. Shortly after getting married, Cynthia and Jeff Reed planned a romantic weekend camping trip. The Springfield couple packed their tent and other supplies and headed to Mutton Creek Marina & Campgrounds near Stockton Lake. Cynthia had only gone camping once as a child. Jeff was the more seasoned camper of the pair but hadn’t spent a night under the stars in several years. They arrived and set up camp, but soon the getaway turned south. Their campsite was a long walk from the bathhouse, and their neighbors were loud long into the night—not that they were sleeping well, anyway. “The air pump didn’t work for the air mattress I brought, so we ended up sleeping in our lawn chairs,” Jeff says. A decade passed before they attempted anything remotely close to camping again. These days, the Reeds and their 8-year-old daughter, Cerise, hit the open road with their pop-up Rockwood trailer, the second camper they have owned. It still has the feeling of a tent, something the family likes, but with the creature comforts they desire: two beds, a small kitchen and a heating and cooling system. “We’re hoping that our new camper will allow us to extend our camping season,” Jeff says. 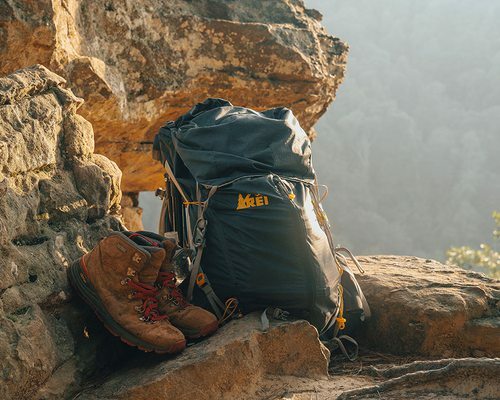 Currently, they camp mostly in May through October, hitting their favorite state parks in Missouri and Arkansas, including Stockton and Petit Jean. That escapism is one reason Springfield resident Teresa Schroeder joined Sisters on the Fly, an international women’s-only outdoors group, in 2009. “We have three rules: no men, no children and be nice,” Schroeder says. After becoming a member, she bought a vintage trailer that her husband, David, refurbished. 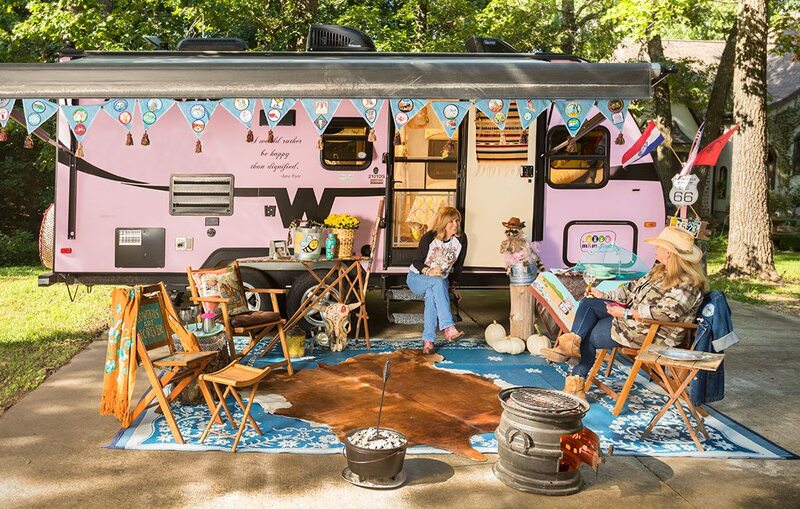 Today, Schroeder sports a 21-foot pink Winnebago Micro Minnie trailer and acts as the group’s Missouri wrangler, the go-to source of information for Missouri members. Sleeping on the ground never appealed to Schroeder. She likes hunting and other outdoor activities but, like the Sisters on the Fly members she knows, hadn’t camped much. 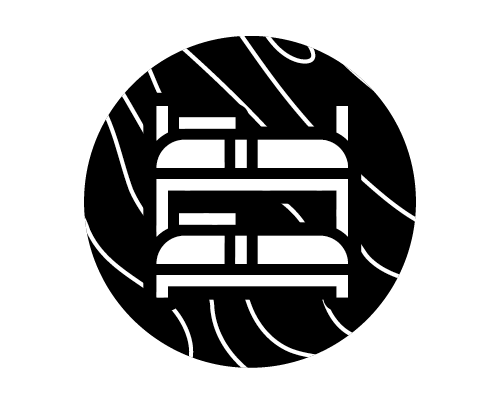 The group offers her a way to sleep under the stars with comfort, ease and, best of all, with like-minded individuals. “I mean I have good friends, but man… I’ve made some of my best friends in this group,” Schroeder says. “And our husbands have become friends. It’s just a wholesome way of life, and you get to see nature.” And regardless of your gear, that’s all that really matters. Skip the tent and get cozy at these five atypical camping destinations. Starting next May, you can spend the night at Camp Long Creek. Sleep in a shepherd’s hut, luxury glamping tent or cottage at this 64-unit campground next to Table Rock Lake. Reservations available now. Forget sleeping on the ground. Table Rock State Park’s two platform tents, $26 per night, are built on a 16-by-18-foot wooden deck. Be sure to bring other gear as it is not provided. Bring your camper and your steed to this northwest Arkansas park’s horse camp. All 42 sites, $18 per night, feature electric and water hook-ups and are located near 20-plus miles of horse trails. Branson Treehouse Adventures’ six decked-out treehouses, plus three others you can rent as a group, are the stuff of childhood dreams. Book Owl’s Roost for the family or Southern Comforts, just big enough for two. Enjoy a romantic getaway at StoneWind Retreat’s super-secluded Sanctuary Suite. The 709-square-foot yurt, from $189 per night, has all the comforts you’re used to: a full kitchen, a bathroom, air conditioning and heat, a TV and Wi-Fi.